The American Heart Association has just issued some curious advice to cardiologists, saying that people should stop consuming butter and replace it with vegetable oils instead. While it’s not surprising to see a group with strong ties to Big Pharma promoting such careless advice, it is very concerning to think of the potential effects it could have on public health if it is followed. The AHA has long gone after healthy fats, and this time it even went so far as to say that coconut oil is bad for your heart. They would say that, of course, because eating these healthy foods keeps people from needing the prescription drugs made by the firms that support the group. Their irresponsible stance has been drawing criticism from doctors with a more holistic viewpoint, some of whom have said this advice is downright dangerous. 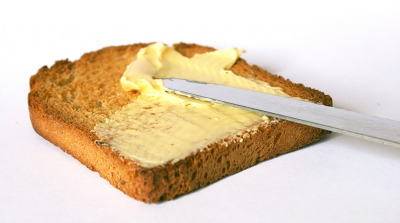 The AHA is suggesting that people eat polyunsaturated fats instead, like those found in vegetable oils and spreads. The problem is that polyunsaturated fats like corn oil and canola oil pose their own set of risks. They promote inflammation, which can lead to cancer, and slow the metabolism. If it’s not enough to make you start running in the opposite direction to hear that nearly all canola oil is GMO, consider the fact that it suppresses thyroid function and immunity and needs extra processing in your body because it contains toxins. Yet they want us to believe that a chemical that was not put on this Earth for human consumption is really so much better for us than natural butter that came from a cow? Meanwhile, corn oil is so bad that even some food manufacturers, who are not usually known for placing a high priority on healthy ingredients, are eschewing it and other GMO oils like soy and canola. Most people know that olive oil is one of the healthiest oils out there and that it has a number of health benefits, particularly organic extra virgin olive oil, but the mixed message here about other oils has done nothing but leave people confused about what they should be eating and what is healthy. How does the AHA benefit from publicizing bad advice? The AHA gets funding from Big Pharma and its livelihood comes from – you guessed it – people having heart problems. The heart attack industry is very profitable, so it’s just smart business from their point of view to avoid promoting anything that could give them fewer clients and cut into their profits. Statins, which are said to lower the risk of heart problems, are widely prescribed and account for a significant portion of the country’s prescription drug spending. They’ve been linked to all sorts of health problems, from nerve and memory issues to liver problems and muscle pain, and yet the FDA says that people should not be afraid to take them. The heart attack industry has a lot of powerful friends, it seems. Osteopathic doctor Jack Wolfson was quick to criticize the AHA for its attack on saturated fat. In commentary published on Natural News, he called the AHA a lobbyist group that collects almost a billion dollars each year in exchange for promoting the agendas of Big Agriculture and Big Pharma. He called attention to an American Journal of Clinical Nutrition study of half a million people that found no connection between saturated fat and coronary disease in 2010. Six years later, the same journal published a study that found that saturated fat reduces cardiac risks. He also pointed out that some foods that contain saturated fats like butter also contain other harmful ingredients, like the refined carbs and sugar in prepackaged desserts, and this could have made it a convenient scapegoat.